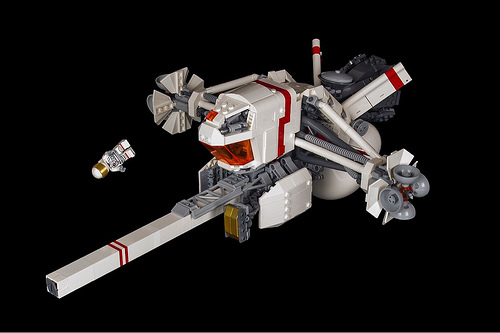 We’re going far away from civilization into the cold reaches of space with this LEGO ship by Chris Perron. But it’s not for fame or glory — no, this ship has a more noble goal: to research! Even Chris admits he’s not quite sure what it’s researching, but one thing is clear: it looks awesome outfitted with highly scientific doodads and whatsits. And there are lots of interesting techniques, from the mix of struts holding up the large side-mounted instruments to the cheese slopes crammed into the front of the ship’s long probe. The one thing that worries me, though, is that the ship doesn’t look big enough for an airlock, which might be bad news for the astroscientist doing an EVA. He scare. He stomp. But most importantly, he chop. 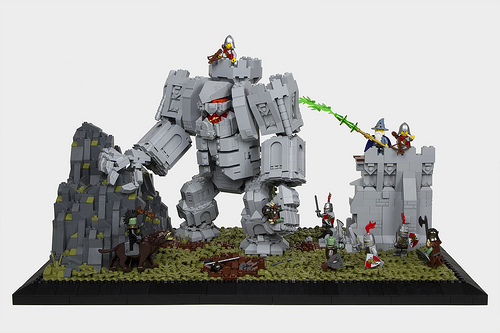 I’ve always loved how a single LEGO piece has the power to inspire an entire build, as was the case with this awesome mech by Chris Perron. The building of this marvelous monstrosity was motivated by the yellow Fabuland ladle part, which Chris wanted to incorporate into a sci-fi creation after seeing it used in a someone’s castle-themed creation. 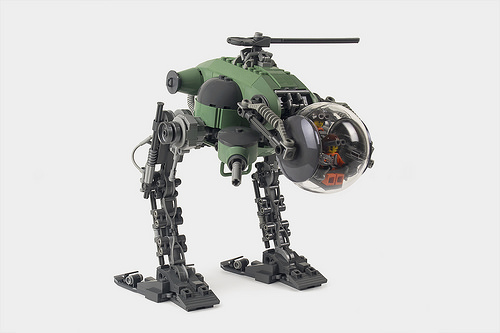 Finding a spot for such a strange piece likely proved challenging, but the builder managed to find a perfect spot for them on either side of the mech’s head, to form what looks like a respirator or perhaps like rounded cheeks. 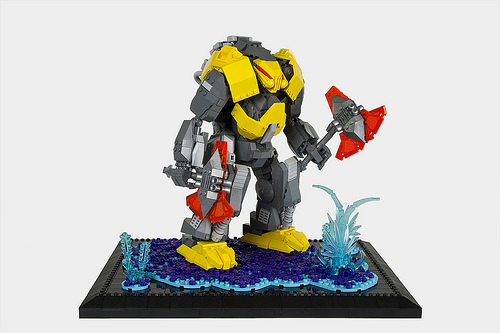 Ladles aside, the build overall looks like a wonderful mashup of Nexo-Knights LEGO universe, Warhammer 40k, and a beefed-up Bionicle Rahkshi. While the builder could have called it a day after the mech was completed, he went the extra mile and made a simple but effective alien environment base, which perfectly completes the final display.